Abstract This paper will discuss the difficulties that have and will continue in defining the medium of television. Despite the terms purest definition, to see at a distance, the term has for many years been used to describe an entertainment medium which is part of the mass media landscape. No longer does the medium or associated devices have differing names; rather the single term, television, is used to define all associated activities and devices. The term was first discussed in the context of the medium of television, in a paper presented by Constantin Perskyi, at the International Electricity Congress during 1900. Almost thirty years later, as television broadcast tests commenced in Britain and the United States, there was still confusion and debate as to whether television was the correct term to use for the new medium. It was described as a novel concept in the Encyclopaedia Britannica. The New York Times asked its readers opinion on names for the new medium. 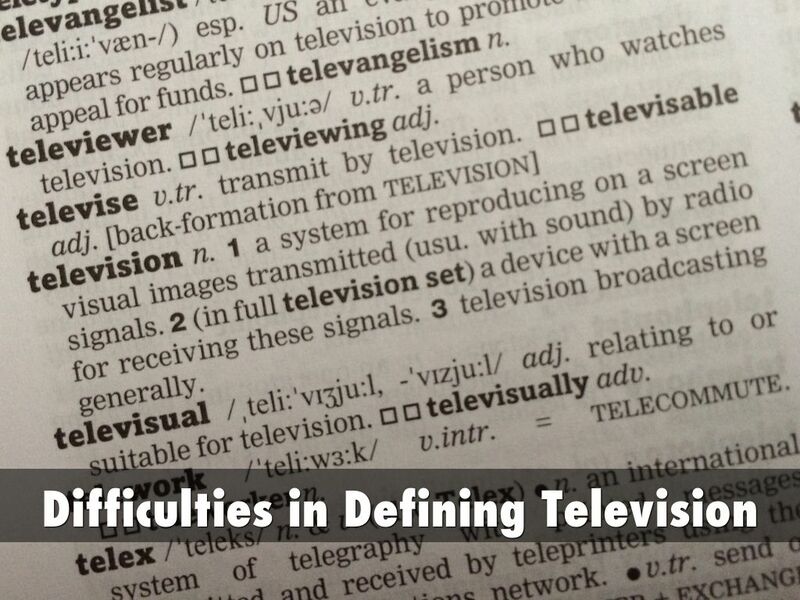 The contemporary misconception of defining television is made evident when its definition is reviewed within dictionaries. The Dictionary of Media Studies (2006) has four definitions listed for television and the Australian Concise Oxford Dictionary (2008) has three. This multipurpose approach in defining television has created confusion, which will arguably increase as television broadcasters attempt to expand distribution through the Internet, and the line between mass media institutions continues to blur. The evolution of television as a platform, institution and popular cultural has historically created difficulties in defining television. 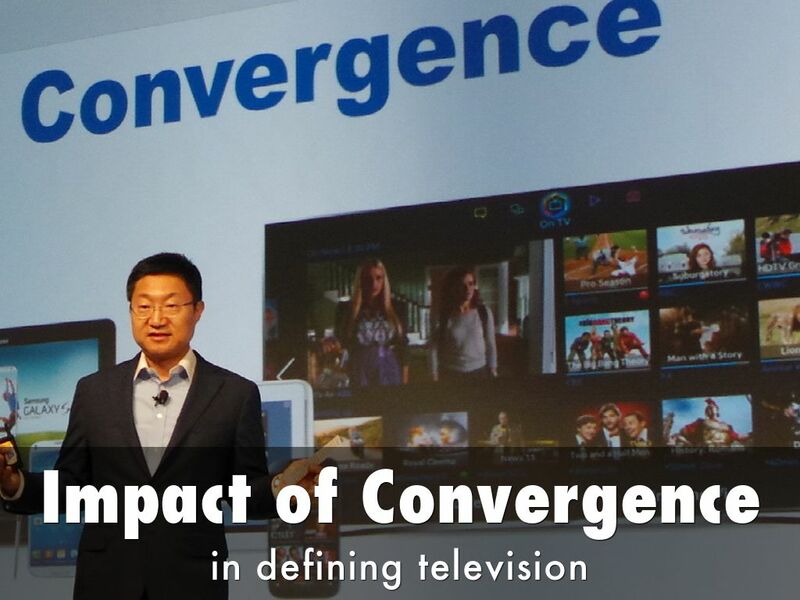 The increase of media convergence is exacerbating the difficulty in defining, what is television? Television is defined as to "see at a distance"
Shift in the audiences interaction with televisual media. 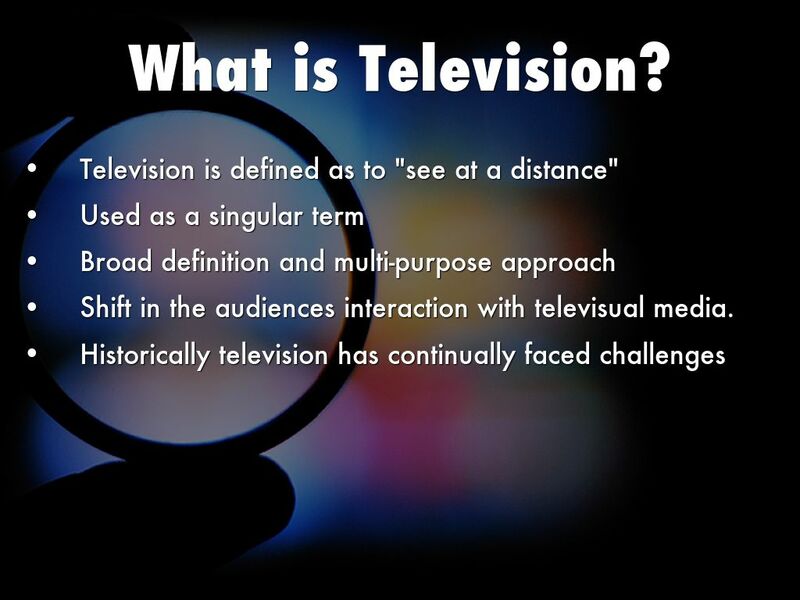 •The term television has evolved since its introduction in 1900, to become interwoven into our daily lives. In its simplest form, television is defined as to see at a distance. •The word, to be used as a singular term to describe not only the set, but also the programs and the institution. The subsequent words used after television. Set, receiver or program, have been subsumed within the single term of television. •This broad definition and multi-purpose approach to the use of the term has created confusion as to what is television? 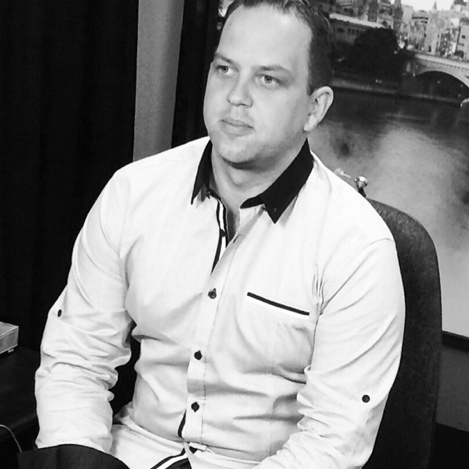 •The past few years, has seen a significant shift in the way audiences both source and view televisual media. This is the result of a multiplicity of technological changes: digital technology replacing analogue, the introduction of various portable media devices, increases in Internet speed and access; in addition to the onset of media convergence. Sparking debate as to whether television is a dying medium; also perpetuating confusion as to how to define television. 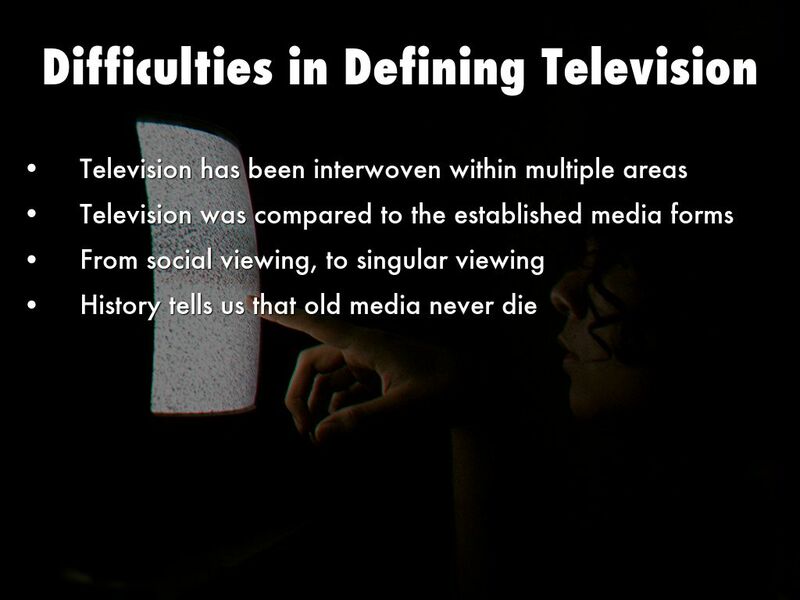 •This paper will argue that changes in defining television are not simply a present issue. When analysed historically, it is evident that television has continually faced challenges that have questioned its definition: politically, institutionally and publicly. • Television has a complex history, which has been impacted by a number of factors across the areas of society, politics and technology. A major factor in the evolution of television was the rate of development and impact of other technologies, which included electricity, telegraphy, photography, radio and motion pictures. • Prior to early television conceptual proposals, defined as distant vision proposals, in Television - An international history of the formative years (1998, p. 4), there were simultaneous developments in both the areas of visual and aural communication technologies. • During 1837 to 1876, work was undertaken in the field of picture and aural telegraphy. These discoveries were influential on television’s early developments, in so far as they allowed for the viewing of visual and aural media to be presented to a large, dispersed mass audience. • Predictions of future developments of the telegraph and telephone were illustrated in the British magazine, Punch, during 1879. Whilst fictional for the era in which it was printed, it depicts a modern social reality, a proposition of converging devices and an early visual representation of future television (Abramson 2008, p. 8). • Whilst television and motion pictures followed similar paths during their early developments. After the manufacturing of Edison’s Kinetoscope peep show viewing machines in 1894, the Lumière brothers created the first commercial projection in New York (Ellis & Wexman 2002, pp. 2-3). From this point, motion pictures evolved rapidly in comparison to television, indeed almost overnight ‘from a laboratory experiment to a full-grown commercial venture’ (Abramson 2008, p. 1). • Despite being established media, both the motion pictures and radio industries feared the impact that the introduction of television would have on their industries. Both attempted to employ extra features as a result. For instance, motion pictures introduced sound and presented some films as three-dimensional. Despite their fears, both survived the introduction of television. Furthermore, both media influenced television in its early technological advances and in its programming. 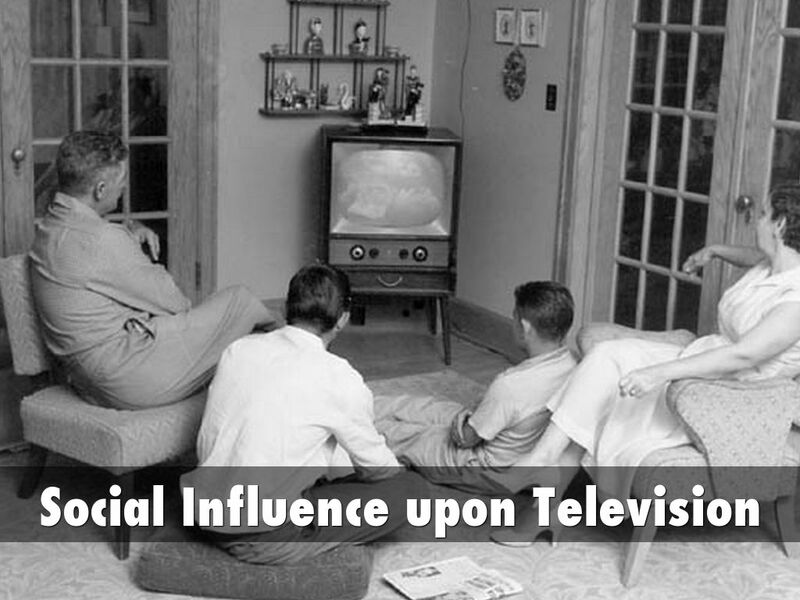 • In addition to the technological developments that influenced the development of television, public interest was also significant as a ‘determinant in the advancement’ of television (Burns 1998, p. 7). During the nineteenth century, the public showed great intrigue and curiosity, for instance, attending exhibitions and spectacles that displayed human deformities, were informative and educative or that stimulated the viewing audience. • Another factor in early television was its comparison to other current media, including print media and motion pictures, which led to criticisms of early television associated with its poor image quality and unnatural replication of movement. It was argued that the concerns were raised by individuals who ‘examined the matter entirely from a theoretical standpoint’ (Moseley & Barton Chapple 1930, p. 37). 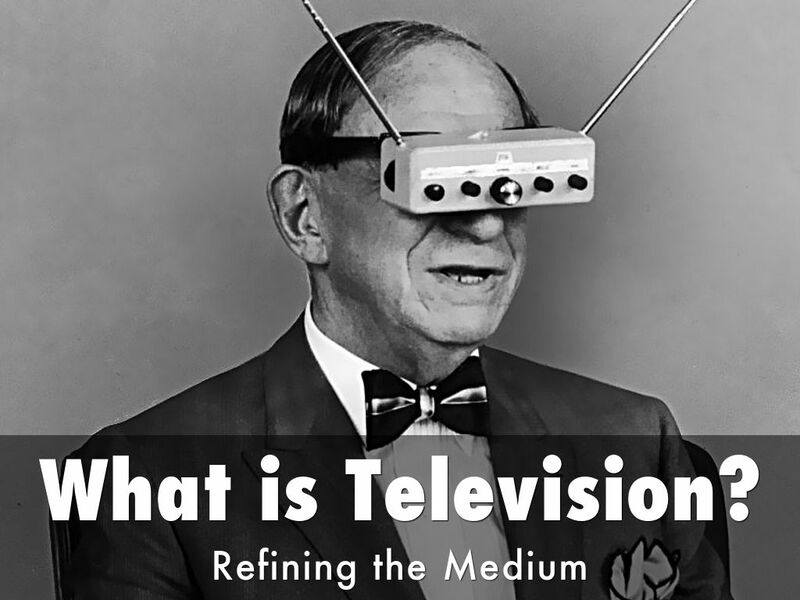 Being a new medium, television in its introduction did not appear to conform to existing perceptions when compared to motion pictures, radio and print media. This comparison is also reflective of the terms used to describe the new medium. 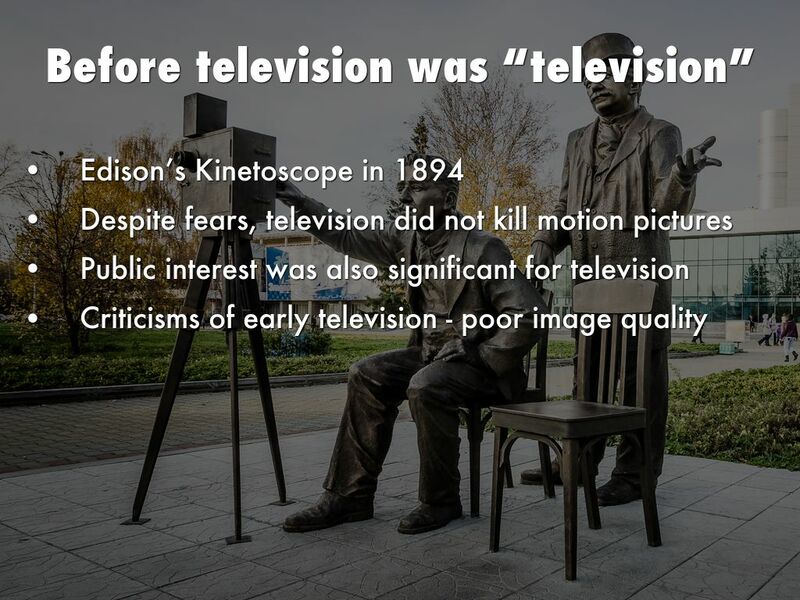 • The term television, in the context of the technology proper, was first discussed in a paper presented by Constantin Perskyi at the 1900 International Electricity Congress (Abramson 2008, p. 23). This was many years after some of the key elements had already been discovered and that would allow for the development of what would later be referred to as television. 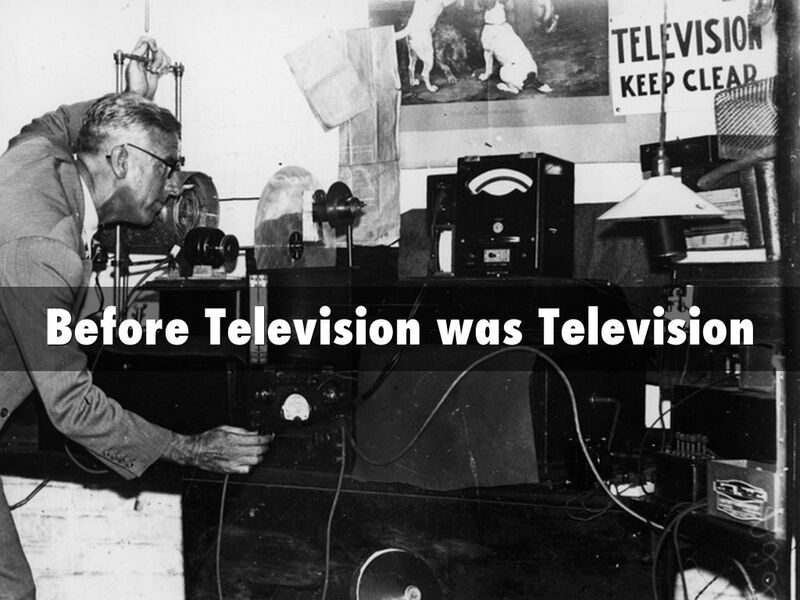 • During its initial development, there were two schools of thought: mechanical television and electronic television. In Britain, early television used the mechanical approach, which was associated with Baird; the sole inventor in the field in Britain. 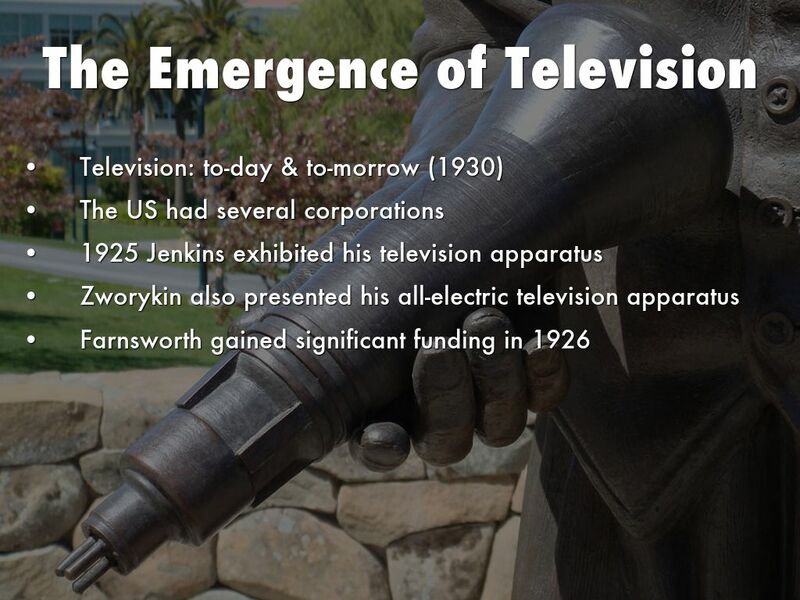 In the United States, there were three key inventors involved in the early developments of television: Jenkins (associated with mechanical television), Farnsworth and Zworykin (electronic television). • The first public demonstrations of television commenced during the 1920s in Britain and the United States. The way in which public demonstrations were presented fluctuated the public opinion and perception of television. In Britain, Baird used his demonstrations in an attempt to assure the British government and the British Broadcasting Corporation (BBC), the only broadcaster in Britain, that television broadcasts should commence in Britain. Baird struggled to convince the BBC to initiate television test broadcasts, arguably due to the fact that during 1928, the BBC was experimenting with the broadcasting of images, using the technology, known as Fultograph; it is best described as a photo slideshow with music (Burns 1998, pp. 177-8). • Whilst there was limited public awareness of Baird’s work, it received immense publicity during 1925, when Baird’s television system was demonstrated as part of London’s famous Oxford Street department store Selfridges’ sixtieth birthday celebration. Burns argued that it was during these demonstrations that the general public first became aware of television. Leaflets handed out to the public stated, ‘television is to light what telephoning is to sound’ (Burns 2000, p. 75). It is interesting to note that the pamphlets did not discuss radio, a major seller for Selfridges at the time. • After multiple demonstrations BBC’s facilities were made available to the Baird Company. During September 1929, television was inaugurated in Britain, although Baird believed that less than thirty people had seen the inauguration (Burns 1998, pp. 303-4). 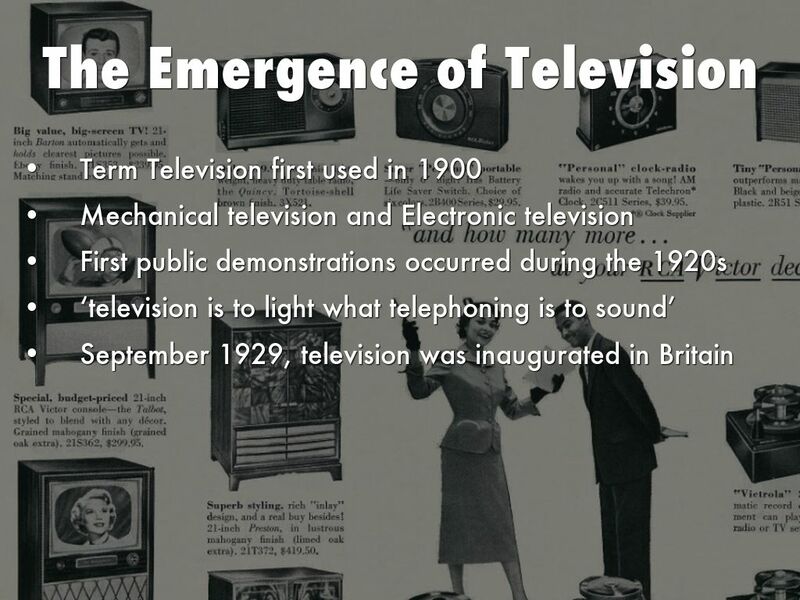 • The year after the inauguration, Moseley and Barton attempted to define television in their publication, Television: to-day & to-morrow (1930). They defined television in two ways: first, as an aid for the public to ‘witness what is happening at some distant place, just as if we were eye-witnesses’ (1930, p. 19). The second definition “true television”, described as - ‘the ability to see, with the aid of electrical methods of transmission, a reproduction on a screen of the image of moving or stationary objects situated at any distance from the observer’ (1930, p. 19). Whilst still broad, these definitions were more closely aligned with the television that had been introduced in Britain at the time. • The United States differed considerably from Britain; it had several corporations associated in the development of television. Each completed demonstrations in house with their own broadcasting facilities, which on occasions were received by other corporations. This was a significant difference from Baird relied on public awareness to gain support to commence test television broadcasts, which required the cooperation of the BBC for broadcasting facilities. • One of the first demonstrations in the United States was during 1925, when Jenkins exhibited his television apparatus to a group of government officials in the United States; the same year as Baird’s Selfridges demonstration. Unlike Baird, Jenkins noted that his demonstration was a scientific test and not a show. Two years after his demonstration, regular television broadcasts began when Jenkins was granted the first television license by the Federal Radio Commission – for Washington DC station W3XK. • During the same period as Jenkins, Zworykin also presented his all-electric television apparatus, in 1925. Despite the perceived success of the demonstration, the vice-president of Westinghouse was not impressed and requested Zworykin be transferred to another project. His later work in the field of television was associated with the Radio Corporation of America (RCA), who became the leader of television in the United States, as well as influential abroad. • Farnsworth, also involved in electronic television, first gained significant funding for his television concept in 1926 (Schatzkin 2002, loc. 643). Farnsworth was not supported by a corporation, so his early demonstrations were an attempt to gain funding for his television concept, thus having many similarities with Baird. After two years of developing a prototype of his television concept, Farnsworth was forced to open his laboratory when investors decided it best to sell the concept (Schatzkin 2002, loc. 891-938). This occurred during the same period that Zworykin moved from Westinghouse to RCA. Farnsworth and Zworykin were later entangled in a patent battle. • By the 1930s, test television broadcasts had commenced in Britain and the United States, but due to the approach in demonstrations, the public’s perception of what television was differed in both countries. • Television was perceived as a novelty, as noted by the Encyclopaedia Britannica fourteenth edition (1929), ‘many technical problems have yet to be solved before television can claim to be more than an interesting novelty’ (as quoted in Emmerson 2009, p. 5). 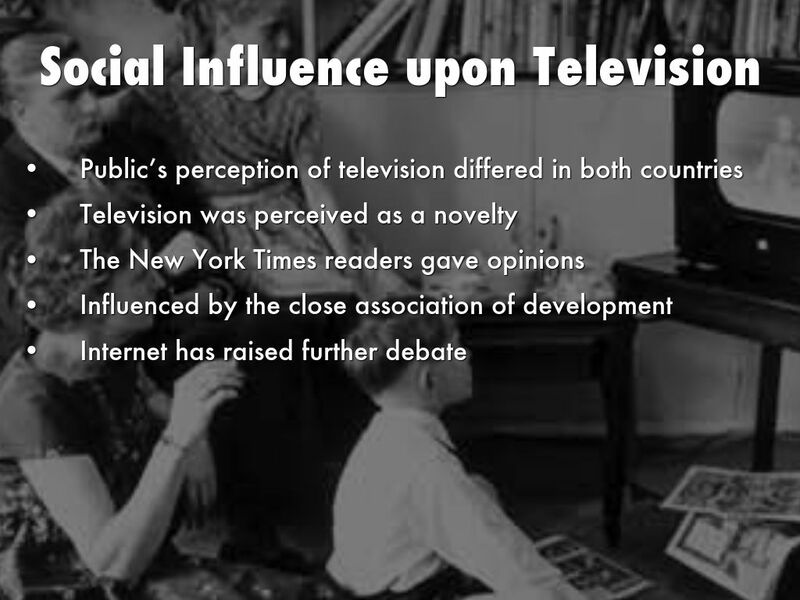 • In the United States, early social views of television were demonstrated in The New York Times. Readers were asked what to call the associated apparatus, the owner and the viewer of television. One reader stated ‘we see with our eyes, we hear with ours ears. Why not combine the two and make the word “eyear” or “earyer” which is more euphonic?’ (Burns 1998, p. 301). Other suggestions included tellser and sightener, for the viewer of television (Burns 1998, pp. 301-2). Not all opinions were positive toward early television, nor its future. One reader stated: ‘I suggest noisivision because the vision will be noisy’ (as cited in Burns 1998, p. 302). This is but one example of the variation in the initial understanding and uncertainty of what television was or would become, particularly in the United States. • This example also makes evident the public perception of television and the merging of terms in an attempt to establish an identity for television. This was influenced by the close association between the development of television and other communication and media technologies, which still continues today. • When viewing media from a historical perspective, it is evident that the media forms of today ‘are actually the result of innumerable small-scale convergences that have occurred frequently throughout time’ (Fidler 1997, p. 27). The recent introduction of the Internet has raised further debate of media convergence and the impact this could have upon television. • During the introduction of television, there are examples of the partnerships between motion picture and television institutions. What is not evident is why, and whether it was to prevent the impact of television or to stake a claim in the new and upcoming media form. 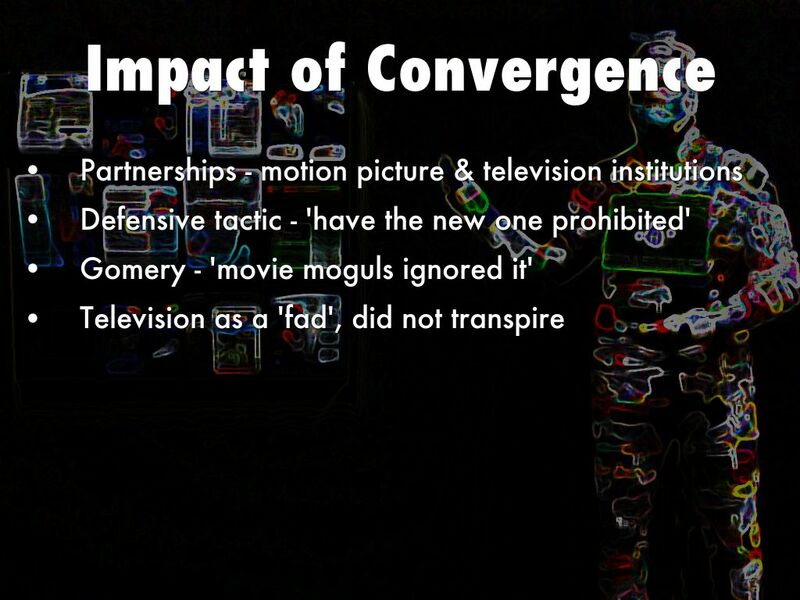 • A similar argument is raised by Gomery who notes that, in the United States ‘movie moguls ignored it; only when it was too late did they do anything about television’ (1994, p. 23). The executives initially saw television as a new fad and believed that, once it had passed, the audience would return to the movie theatres. The industry also believed that the quality of television would not equal that of motion pictures (1994, p. 23). • The perception by the motion picture executives of television becoming a fad did not transpire, as the public continued to purchase television sets. In the United States, Paramount, one of the Big Five studios was involved in a number of companies associated with television, initially with a forty-nine per cent share in Columbia Phonograph Broadcasting System (later CBS), as early as 1929. Paramount was later associated with the television manufacturer, DuMont, and had an interest in the first Chicago television station, W9XBK (Stokes 1999, p. 24). • Another example in Britain was the takeover during 1932 of Baird Television Limited by Gaumont-British, which in 1940 was itself taken over by Rank. The involvement of the two companies altered the focus for Baird, from home television to television broadcasts within movie theatres throughout Britain. • When television became established as a commercially viable medium, it did not replace the existing media. In fact, it ‘learned from the theatre, from radio, and from pictures’ before it developed its own distinctive entertainment structure (Hutchinson, T 1946, p. x). • The interlinking of the various media later stimulated discussions associated with the convergence, from both a technological and content perspective. The use of the term convergence in writing about television has created confusion socially, institutionally and within academia. 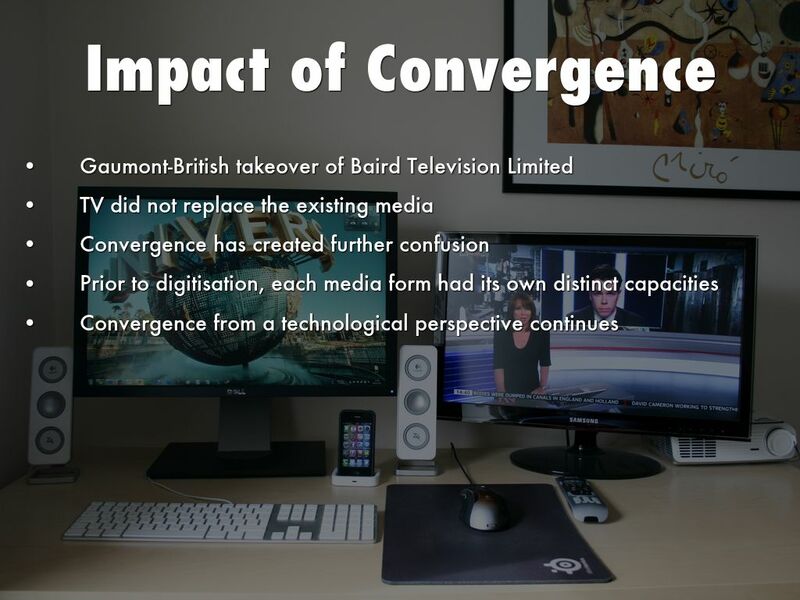 The term convergence, as argued by Brand (1987), Fidler (1997), the Productivity Commission (2000) and Gordon (2003), was first used in association with media and communication during the later part of the 1970s to early 1980s. During the 1980s, convergence was still seen as futuristic by the general public. Despite public opinion, media companies began to stake a claim, buying various media outlets, including newspapers, radio and television stations, and outdoor advertising firms (Pavlik & Dennis 1993, p. 3). • More recently there has been a significant shift towards digital media and communication technologies, which has added to the debate of what is television? Prior to digitisation, each media form had its own ‘distinct capacities and constraints’ (Hodkinson 2010, p. 33). This distinction left them separated due to the technology associated with that particular form of media or communication; for example, viewers had to use a television set to watch a television broadcast. A single device only allowed for the engagement of a single media format. Digitisation has allowed for ‘text images, music speech and video all to be converted into a universal system’ (Hodkinson 2010, p. 33). Almost twenty years earlier, De Sola Pool argued that electronic technology would allow for all modes of communication to form ‘one grand system’ (1983, p. 20); a proposition representative of the Internet. Castells adds further to the debate with his adaptation of de Sola Pool’s ‘grand system’ theory (1983 p. 20). He argues the theory that ‘computers, the Internet, and the media’ (2003, p. 188) would converge into one box in the living room, was a notion that had failed. This was not due to technological limitations, but due to the hypothesis from the media institutions. The institutional view was that all consumers were concerned about was access to unlimited content (2003, p. 193). H. Jenkins’ statement was made more than twenty years after the first use of the term convergence In recent decades, continuous development in media technology, along with the public and broadcasters’ use of alternative distribution methods, has again challenged the definition of television and its existence. 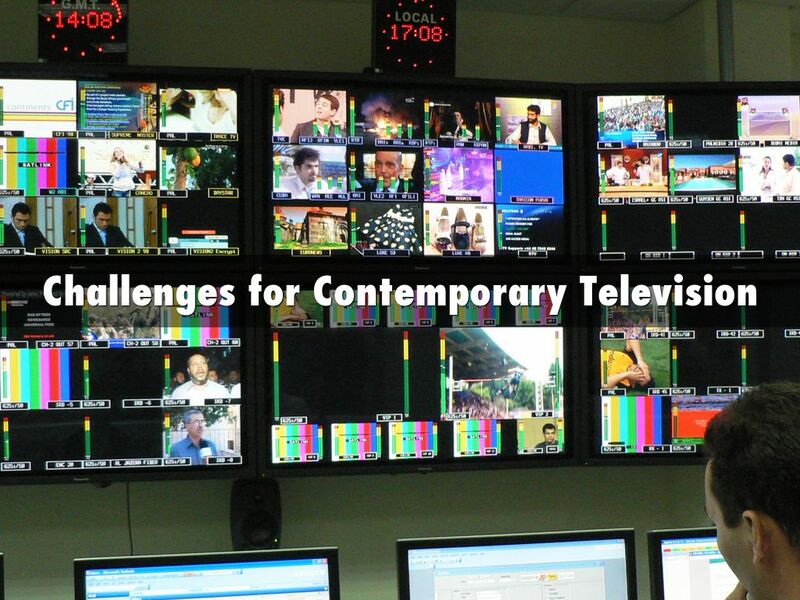 • The use of the Internet and alternative devices in viewing televisual material challenges defining television from an institutional, technological and social perspective. Just as the old media of motion pictures and radio had to adapt when television was introduced, now television must adapt to the challenges of the availability and ‘expansion of the format market’ (Moran 1998, p. 18). • H. Jenkins (2001), Bruns (2008) and Perryman (2008) have written ‘transmedia storytelling’ a new storytelling method, that they argue could be the future of television. They argue that this approach will allow both traditional television broadcasts and online media to co-exist. • The use of the Internet as a distribution method for televisual material has also prompted debate about the death of television. 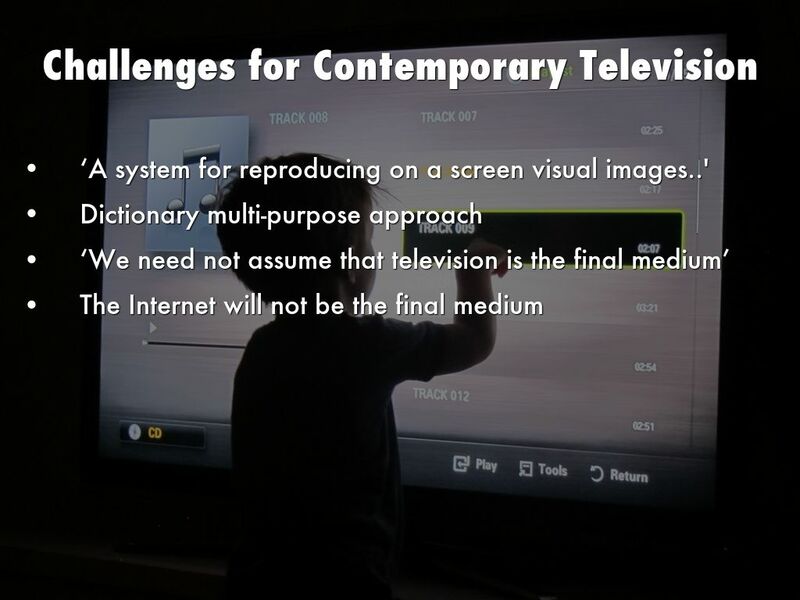 Such works as Given (2003), Spigel and Olsson (2004), Lotz (2007) and S. Ross (2008) all question the future of television. These works build upon Glider’s book, Life after television (1994). Glider argued that the concepts of high definition, interactivity and information superhighways are all ‘merely cosmetics for the corpse of giant industries approaching the end of the road’ (1994, p. ii). 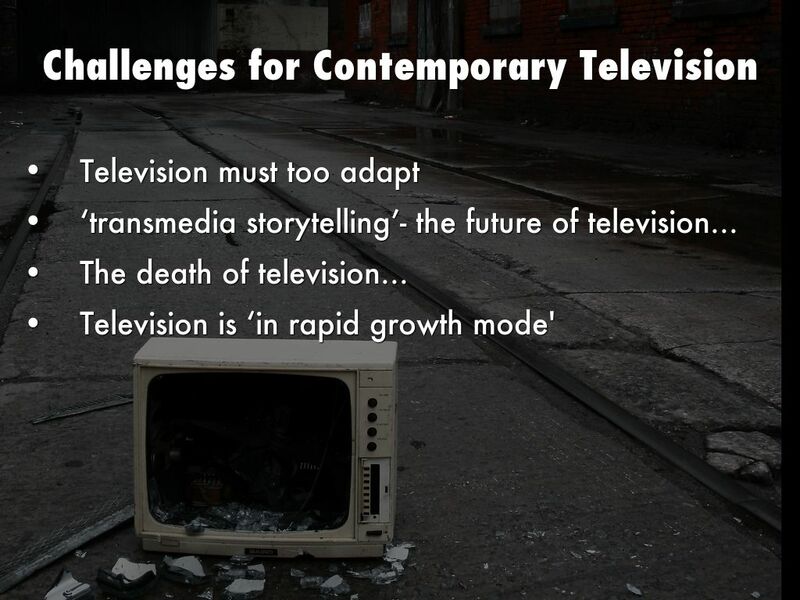 • In contrast to these works, Cunningham argues that, in fact television is ‘in rapid growth mode in major developing regions like south and east Asia’ (2012, p. 1). This is supported by the recent increase in the global penetration rate of television, which by the end of 2012, was 79 per cent; a two per cent increase from 2008. This growth was due to the increase in the developing world, from 69 per cent (2008) to 72 per cent (2012); the developed world remained at 98 per cent (International Telecommunication Union 2013, p.162). • These changes discussed above have resulted in a multi-purpose approach in defining television, as evident by contemporary dictionary definitions. The Australian Concise Oxford Dictionary describes television as, first ‘a system for reproducing on a screen visual images transmitted (usu. with sound) by radio signals’. Second, ‘(in full television set) a device with a screen for receiving these signals’, and third, ‘television signals in general’ (2008, p. 1470). • The multi-purpose approach is also evident in the Dictionary of Media Studies, a publication specifically focused on media. It lists four definitions for television, first ‘an electronic device for receiving and reproducing the images and sound of a combined audio and video signal. Also television set, tv, telly’; second, as ‘a system of capturing images and sounds, broadcasting them via a combined electronic audio and video signal, and reproducing them to be viewed and listened to. Also called tv’; third, as ‘the image, sound or content of combined audio and video broadcast’; and fourth, as ‘the industry concerned with making and broadcasting programs combining images and sound’ (2006, p. 235). The multi-purpose approach as evident in the Australian Concise Oxford Dictionary and the Dictionary of Media Studies, further amplifies the difficulties associated with defining what television is and establishing a singular definition. • Arguably this more ‘sophisticated medium’ discussed by De Fleur could be comparable to the Internet, a medium not yet realised when his paper was published. It should also be noted that the Internet itself will not be the final medium. Therefore, television, along with other media, will face future challenges from new media. • It is clear from the areas discussed why it is difficult to establish a singular definition for television. 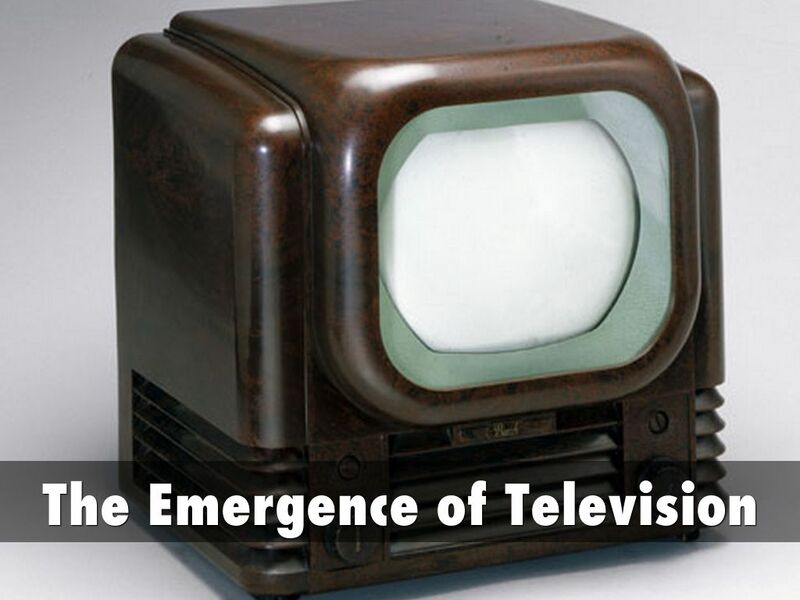 Since its introduction, television has been interwoven within multiple areas, across technology, society and politics. Technologically, the television set has evolved from a mechanical system demonstrated by Baird, to large high definition smart televisions. The institutions involved in the early development of television had varied approaches, both from a technological and publicity perspective. This had an impact on the way in which early television was defined and perceived by the public. • During its early development, television was compared to the established media forms, creating varied perspectives of television’s early success. The comparison of new and old media still continues today, although it is now television that is being used as the prime comparative medium. The use of the Internet as a broadcast platform has further questioned television’s definition. • Culturally, we have begun to move away from viewing television socially as a group, to singular viewing on smaller devices. These changes have forced television institutions to examine their role. Debate about television continues across technological, social and political areas. The multi-purpose approach will continue and expand as society continues to expand the number of devices on which one can view television content. • How television will be defined in the future or what it will resemble is not clear. While some may argue that television is dying, television, both as a term and as an institution, will remain. History tells us that old media never die. 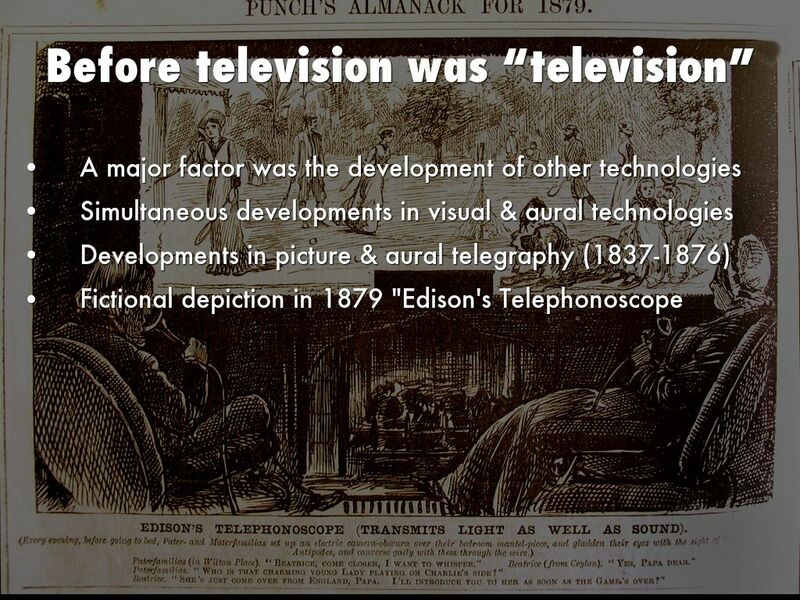 Abramson, A 2008, The History of television, 1880 to 1941, McFarland & Company, London. Brand, S 1987, The media lab: inventing the future at MIT, Viking Penguin, New York. Bruns, A 2008, Reconfiguring Television for a Networked, Produsage Context. Media International Australia Incorporating Culture and Policy: quarterly journal of media research and resources, no. 126. Burns, R 1998, Television - An international history of the formative years, IEE History of Technology Series, vol. 22, The Institution of Electrical Engineers, London. —— 2000, John Logie Baird, television pioneer, e-book, The Institution of Electrical Engineers, London. Castells, M 2003, The Internet galaxy: reflections on the internet, business, and society, Oxford University Press, Oxford. De Fleur, M 1966, ‘Mass communication and social change’, Social Forces, vol. 44, no. 3, pp. 314-26.
de Sola Pool, I 1983, Technologies of freedom, Belknap Press, Google Play version, Available at Play.google.com. 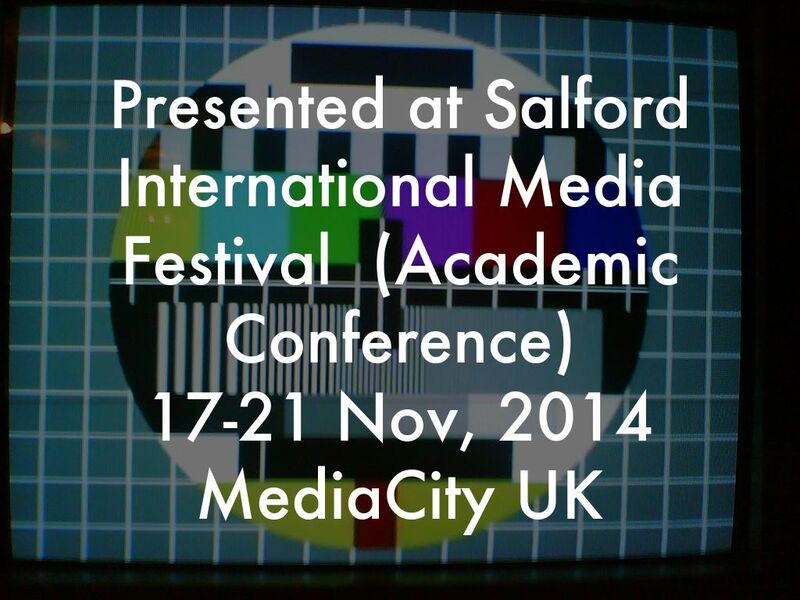 Dictionary of Media Studies, 2006, A & C Black, London. Ellis, J & Wexman, V 2002, A history of film, 5th edn, Allyn & Bacon, Boston. Emmerson, A 2009, Old television, Shire Publications, Buckinghamshire. Fidler, R 1997, Mediamorphosis: understanding new media, e-book, Pine Forge Press California. Flew, T 2007, Understanding global media, Palgrave Macmillan, New York. Given, J 2003, Turning off the television: broadcasting’s uncertain future, University of New South Wales Press, Sydney. Glider, G 1994, Life after television - The coming transformation of media and American life, Rev. edn, W.W. Norton & Company, New York. Gomery, D 1994, ‘Failed opportunities: the integration of the U.S. motion pictures and television industries’, in N Browne (ed. 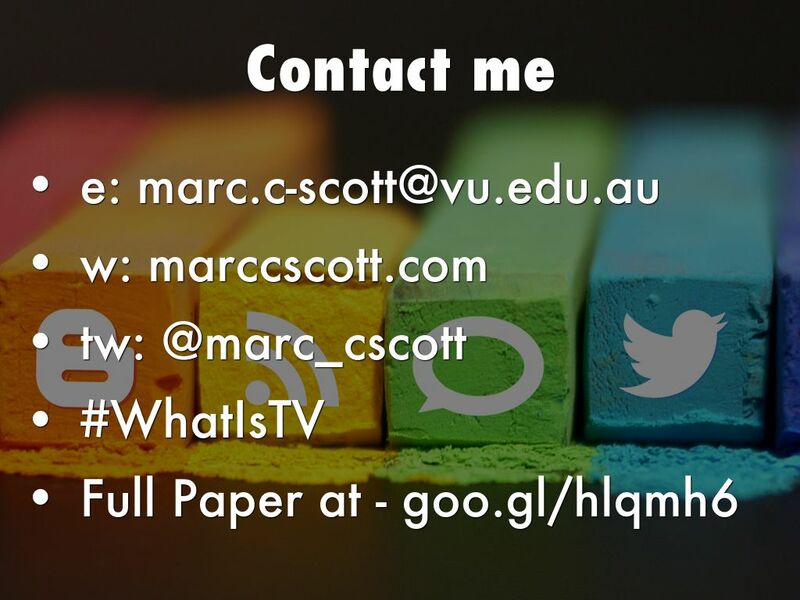 ), American television: new directions in history and theory, Hardwood Academic Publishers, Camberwell. Gordon, R 2003, ‘The meanings and implications of convergence’, in K Kawamoto (ed. ), Digital journalism: emerging media and the changing horizons of journalism, Rowman & Littlefield Publishers, Lanham. Hodkinson, P 2010, Media, culture and society: an introduction, Sage Publications, Los Angeles. Hutchinson, T 1946, Here is Television, Hastings House, New York. Jenkins, H 2001,‘Convergence? I diverge’, Technology Review, June, p. 1. Lotz, A 2007, The television will be revolutionized, New York University Press, New York. Moran, A 1998, Copycat television: globalisation, program formats and cultural identity, University of Luton Press, Luton. Moseley, S & Barton Chapple, H 1930, Television: to-day & to-morrow, Sir Isaac Pitman & Sons Ltd, London. Pavlik, J & Dennis, E 1993, Demystifying media technology: readings from the freedom forum center, Mayfield Publishing, Mountain View. Parkinson, D 2002, History of film, Thames & Hudson, London. Perryman, N 2008, ‘Doctor Who and the convergence of media: Case study of ‘transmedia storytelling’, Convergence: International Journal of Research into New Media Technologies, vol. 14, no. 1, p. 18. Ross, S 2008, Beyond the Box: television and the Internet, Blackwell Publishing, Malden. Rogers, E 1995, Diffusion of Innovations, 5th edn, Free Press, Crows Nest. Schatzkin, P 2002, The boy who invented television, TeamCom Books, Kindle version, Available at Amazon.com. Spigel, L & Olsson, J 2004, Television after TV: essays on a medium in transition, Duke University Press, London. Stokes, J 1999, On screen rivals: television and cinema in the United States and Britain, Macmillan, Houndmills. Turner, G & Tay, J 2009, Television studies after TV: understanding television in the post-broadcast era, Routledge, Abingdon. Woodhead, L 2012, Shopping, Seduction and Mr Selfridge, e-book, Random House, New York.